Health risks grow as relative humidity falls — Tim Scott. Many organisations in the building services industry, including CIBSE and BSRIA, recommend that the ideal indoor humidity for human health and comfort is in the range 40 to 60% RH. However, in a recent survey of over 290 HVAC consultant and contractor offices across the UK and Ireland, carried out by Condair, the average office humidity reported was 38% RH (February 2017). Some offices were as low as 20% RH, which is drier than the Sahara Desert. You would expect that the people responsible for maintaining the nation’s indoor climate would themselves, for the sake of their own staff’s health, be within the recommended range. So given that even our own industry isn’t compliant, what is the basis for this recommendation of 40 to 60% RH, and what happens to us if our environment falls outside this condition? Scientific research into the effects of humidity on the air, specifically with regards airborne infection, was being carried out as early as the 1930s and 1940s. Early experiments with mice by Loosli et al. in 1943 showed airborne flu remained active and infectious for much longer at low humidity, under 40% RH. More recent studies around the same hypothesis by Noti et al. in 2013 used mechanical nebulizers to ‘cough’ flu virus into a room at varying humidity levels and air samplers to assess its infectious nature. The results were similar and demonstrated a dramatic drop in the flu virus’ ability to survive in air at more than 40% RH. 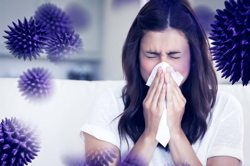 Numerous other studies, taking place between these two, have also shown that atmospheres maintained at above 40% RH significantly curtail the airborne transmission of flu and other viruses. A review of over 20 such investigations since 1960, carried out by Jane Metz and published in the Journal of Infection in 2015, concluded that ‘the prospect of reducing influenza-associated morbidity and mortality by increasing the absolute humidity in ... public spaces is an exciting and novel potential strategy for disarming flu’. Dry air has three adverse effects. It affects a body’s natural defence airborne pollutants, promotes airborne viruses and affects a body’s natural defence against them, and affects the immune system, eyes and skin. 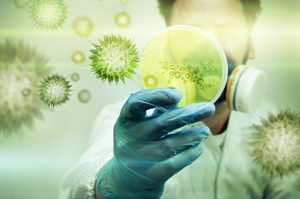 Two reasons are put forward to explain the detrimental effect humidity has on airborne germs. First, it’s been shown that droplets remain airborne for longer if they are less than 5 µm in size. If an atmosphere is dry, droplets breathed or coughed from an infected person rapidly shrink through evaporation, leaving more at 5 µm or less in size and capable of remaining airborne for long periods. Secondly, when viruses are contained in a tiny airborne hydrated droplet, the dissolved salts and proteins are harmful to the virus, rendering them inactive. In dry atmospheres, the droplets lose all their moisture from evaporation. The virus is preserved in a dry airborne particle and remains infectious without the salt and protein solution to attack it. So dry air has the double-effect of causing more infectious droplets to remain airborne and prolonging the infectivity of the suspended floating airborne viruses. Beside the risk of promoting airborne virus transmission, low humidity also directly impacts on the human body. Few of us need scientific evidence to believe that our skin is drier and cracks more in the winter than the summer. We feel and experience it for ourselves. However, there are still plenty of scientific studies that have quantified the detrimental effects, such as Sunwoo et al. 2006. Groups of young and old males were exposed to air at 10, 30 and 50% RH and were monitored for the effect on their skin, eyes and the function of ‘mucociliary clearance’. This is the respiratory system’s primary line of defence against airborne infection and involves mucous in the nose and throat capturing airborne pollutants and transporting them to the digestive system, where they are destroyed. Sunwoo’s results showed that 20% less moisture was lost from the skin at 50% RH than at 10% RH, that people’s eyes were drier at lower humidity, causing them to blink significantly more to compensate, and that it took significantly longer for pollutants to be cleared from our nose in a dry room. Interestingly it also showed that people felt colder at lower humidity, indicating higher room humidity could result in a 2 K reduction in the required room temperature. Given that dry air promotes airborne viruses, the fact that it also detrimentally affects our body’s defence against them, is the most worrying of these effects of low humidity on the human body. As it occurs inside our nose and throat, it is also the most unnoticeable. Salah et al., 1998, specifically examined the effects of breathing dry air by depositing saccharin into subjects’ nostrils while they breathed either dry or regular room air and having them swallow every 30 seconds until they could taste it. When breathing dry air, the time it took the subjects to taste the saccharin increased by more than one third. Salah concluded that ‘breathing dry air results in excessive water loss by the nasal mucosa, which may in turn reduce nasal mucociliary clearance’. Atmospheres maintained at above 40% RH significantly curtail the airborne transmission of flu and other viruses. So given that there is a lot of scientific evidence showing indoor atmospheres should be maintained at above 40% RH for human health, why is it that even our own industry’s offices suffer low humidity in the winter? Unfortunately, even though many organisations recommend a scientifically proven healthy indoor humidity level, Government-backed directives fail to specify it. This is even true for areas such as healthcare establishments, where many infectious and susceptible individuals come together. The main driver for not operating humidifiers is frequently to reduce costs and energy consumption. But when staff costs typically account for around 90% of business expenditure, the true cost of not maintaining a healthy indoor humidity is increased absenteeism, reduced employee productivity and, ultimately, lost profits for the employer. Tim Scott is head of sales at Condair.